Día de Muertos is celebrated in Mexico over several days coinciding with the Catholic observances of All Saints’ and All Souls’ Days (Nov. 1 and 2). The holiday has roots in both ancient pre-Hispanic celebrations and medieval Spanish Catholic practices, and has evolved to feature a blend of elements from both traditions. The celebration is considered to be a festive time when families remember their dead and honor the continuity of life. The MOA’s annual exhibit celebrates this uniquely Mexican observance. 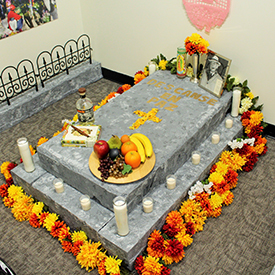 The exhibit’s centerpiece is a traditional ofrenda, an altar with food and beverage offerings, flowers, sugar skulls, and photos of deceased family members. This year, the colorful exhibit features vignettes on various aspects of the celebration as well as a section for visitors to contribute how they observe the holiday. 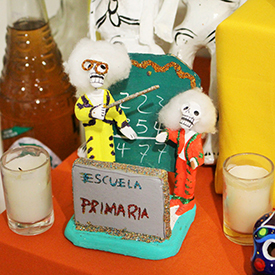 It also includes information on the celebration’s history and its unique skeleton-themed folk art. The exhibit presents text in English and Spanish.